This will be our tenth year for our CSA program. Subscribers from the Northern Ohio area get the "cream of the crop" for as long as they desire in the form of weekly boxes of organic veggies, fruits, grains and free-range eggs. Click here for a list of what is available by month. We offer full shares with produce, eggs, beef and pork; produce and egg shares; produce only shares and a smaller single share with or without eggs. All natural pork, beef, free range broiler chickens and turkeys are also available. We are a 52 week CSA program and customers may choose to join at any time. Customers can choose a 4 week program, a 20 week Summer program or the yearly 52 week program. Payment can be made on a weekly, monthly, quarterly or annual basis. Discounts for 20 week and 52 week subscribers are available. Everything we provide is grown or raised locally. Each farmer in our group uses natural growing methods and adheres to our farming techniques. Most CSA members pick up their weekly boxes at the many drop off locations we have. Others choose to have their boxes delivered to their home or business (additional fee). Spring/summer drop off locations may include Elyra, Grafton, Lakewood, Medina, North Olmsted, Oberlin, Vermilion and Wakeman. Current pick up locations, days of the week and time of day are available by contacting us at murrayhillfarm@gmail.com. A CSA (Community Supported Agriculture) program consists of a community of individuals who pledge support to a farm operation so that the farmland becomes the community’s farm, with the growers and consumers providing mutual support and sharing the risks and benefits of food production. Members or shareholders of the farm pledge in advance to cover the anticipated costs of the farm operation and farmer’s salary. In return, they receive shares in the farm’s bounty throughout the growing season, as well as satisfaction gained from reconnecting to the land. Members also share in risks, including poor harvest due to unfavorable weather or pests. Supporting local farmers through CSA subscriptions is one way to ensure the growth of a small-farm economy, which in turn ensures the availability of wholesome, local, fresh food. 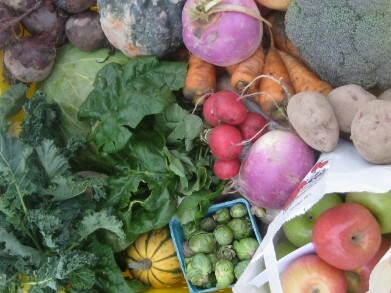 We have been subscribing to the Winter and Summer CSA at Murray Hill Farm for 3 years. We obviously have been very satisfied with the quality of the produce and other products that they provide. Chuck is always accommodating if we cannot make our normal pickup time/day. Often he adds in extra produce if it is available making up for any weeks that may have had fewer items due to weather. We have received much more organic produce than we could purchase in the store for the cost of the CSA. Chuck offers discounts and extra products for early payment every season and it keeps us out of the big box grocery stores which is what our original goal was. His produce is incomparable, non GMO and free of chemicals and pesticides. The CSA at Murray Hill has been a wonderful resource for our family. I would recommend it to anyone looking to support local business. As with others, this was our first CSA experience. It has been well worth it! The food quality is excellent. Chuck is a pleasure to work with. He is informative and responsive. We look forward to ordering from him in the future. Our winter share with Murray Hill Farm was the first CSA experience we have ever had, and I must say it exceeded our expectations by far. We were astounded at the wonderful variety of vegetables, fruit, meats, eggs, grain products, and all of the great extras like honey, maple syrup, jam, cider and so much more. Everything was of the highest quality and so flavorful. The meat literally melts in your mouth. You can really taste the difference when you buy locally grown food. 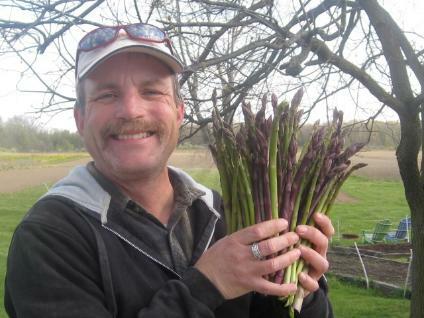 Chuck is very knowledgeable, great to work with and you can see that he puts his heart and soul into his farm. He cares about his CSA customers, answers any questions we may have, and shares a glimpse of his life on Murray Hill Farm through his website and facebook page. It is so much fun to see the video clips he posts. It makes you feel like you are right there working right along side of him, plus it is great to see where your food comes from. I encourage you to give the Murray Hill CSA a try. You will be glad you did! I greatly enjoy being able to support Murray Hill Farm. The produce and eggs are always farm fresh and delicious. I enjoy the variety of veggies each week. Chuck does a great job of sending out emails and updates with wonderful recipes. Thanks Chuck! I was content with the happy vegetables, chicken, beef, pork and eggs I received, at a reasonable price. Chuck is committed to provide good quality. I am glad to renew my CSA membership for a second summer. Thanks Chuck! The fresh eggs and vegetables are great. Always a wide variety to choose from. All organic and I don't have to worry about any chemicals. Mr. Murray is very knowledgeable of his products and always offers advice.